After the first taste of reflow soldering, Eric and I, as good engineers are wont to do, decided that the task was begging for automation. In particular, we decided that it was sorta silly that the cheapest commercially available reflow oven goes for $500 driving most hobbyists to resorting to a mundane toaster oven. A thermocouple ordered on Ebay, a simple relay, and about 30 minutes later we managed to hack together a simple reflow toaster oven with a soldering profile hard coded to the paste that we are using. The exercise, and the fact that the breadboard solution was rather unwieldy and inelegant got us thinking that it might be worth building a more integrated solution to what seemed like a fairly common problem with no particularly easy solution. A little bit of market research did reveal some previous projects that people had done to the same basic effect, but none of them were particularly convenient or streamlined. The reflow controller that we were planning would consist of a relay to control the power to the toaster, a thermocouple to measure the temperature of the oven, and a simple interface. The interface would be comprised of a 3 digit 7-segment display, a knob, a button, and some LED indicators. All of this should fit into an AC wall plug enclosure from Polycase that we will eventually be able to customize to our needs. The idea is that you plug this unit into the wall and then use the receptacle on the back to plug in your toaster oven. 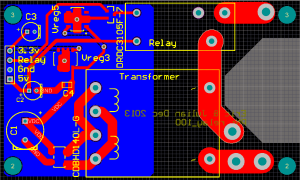 The first part of this project is the relay and power supply. The goal here is to create a module that can both transform and control a standard AC 120V wall outlet. Normally our electronics projects utilize an external AC adaptor that brings us 5V DC power directly to our board. In this project, because we want to keep everything self contained and because we’ll be controlling the outlet, we want to avoid the inconvenience of plugging in multiple devices and combine these two items into one. To do this, we connect a transformer in parallel with the relay and the outlet in series with the relay. This will make sure that the microcontroller receives power even when the relay is cutting power to the outlet. The power supply half of the board consists of a transformer to bring the voltage down to 5V, a bridge rectifier to flatten the AC signal out into DC, and a collection of voltage regulators and capacitors to generate a consistent output. We ended up providing both a 3V and a 5V output. For the relay part of the board, we used a relay driver and a power relay. Many other solutions use a solid state relay, but our initial experiences indicate that it may not be necessary and would be significantly more expensive. It remains to be seen whether the power relay will be sufficient. 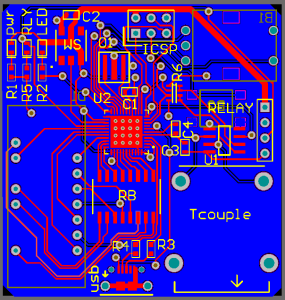 Here is the PCB that we ended up designing. Notice that there are mounting holes and a cut-out on the right side for the outlet pins that protrude up into the inside of the case. Polycase very nicely provides 3D models of all of their cases for download. 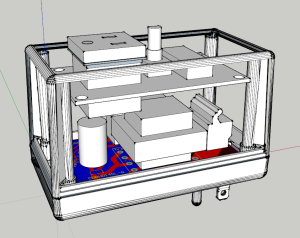 It was a bit of a trick to get the CAD file transformed into a format that SketchUp could recognize, but once done, the model proved an extremely useful tool for both visualizing the product and ironing out details such as PCB size and shap, hole location, and header location as well as part clearance. Here is a view in SketchUp of one of our earlier versions of this. Because this 3D model is only used for planning purposes, many of the pieces that I used are simply approximations of how the part would look. 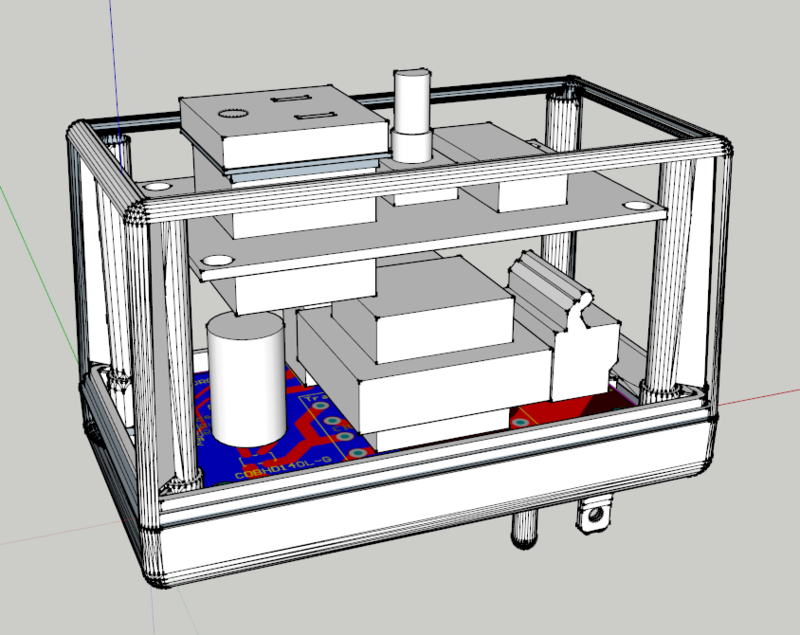 Most of these components were build in SketchUp using their respective datasheets as a guide. The upper layer PCB shown in the image above is where the controller itself lives. This board will contain the microcontroller, the controls, and the connectors. We decided to build this board “upside down” by placing almost all of the parts facing down (away from the front panel). The exception, of course are the pieces that actually do need to face the front panel such as the 7-segment display, the buttons, the encoder, and LEDs. We did this to provide a little more breathing room for all of the parts that we needed to fit on there as the PCB was getting pretty tight. 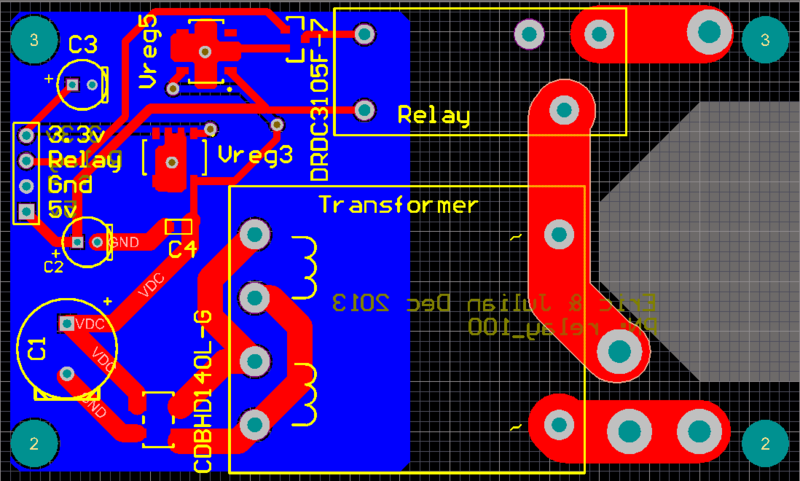 Here is the current version of the PCB as of writing this. One of the most exciting things about this project so far has simply been all of the designing that has gone into the 3D aspect of working within the case. 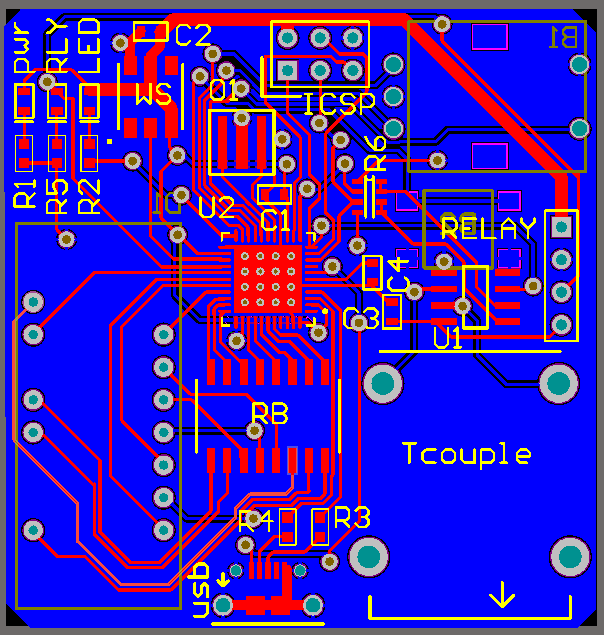 In the past it has simply been a matter of getting all the parts on the board and hoping for the best, but now there are real world space constraints and physical requirements such as mounting holes and clearance is something that matters much more now that we’re working in multiple layers on multiple boards with large components. Look for the Kickstarter when this gets off the ground and I’ll hopefully post again with an update when we start getting these boards printed.